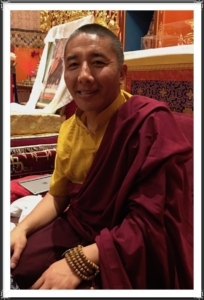 Back by popular demand, TLC is very happy to have Khenpo Paljor Gyatso teach for us again. Khenpo was born in Amdo, Tibet, and was recognized as a child to be the rebirth of a lama from a nearby monastery. He began monastic life at nine and entered Larung Tarig College of Lharung Gar Monastery in Tibet at sixteen. At the young age of 25 he received the distinguished title of Khenpo, an equivalent of ‘Doctor in Buddhist Philosophy’. Khenpo was a disciple of Khenchen Jigme Phuntsok and Khenchen Tsultrim Lodro among other Masters, and has taught at various dharma centers throughout the US. Khenpo Paljor’senthusiasm for dharma and his skill are a great source of wisdom, warmth, and delight.